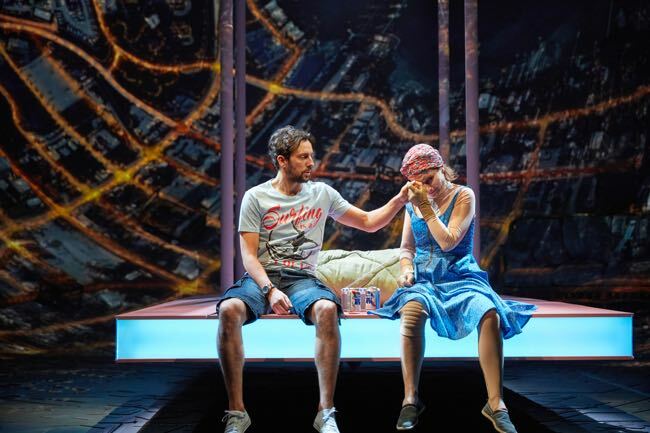 LONDON – Mind over matter is refined in Lindsey Ferrentino’s absorbing new play “Ugly Lies the Bone” at the National Theatre to the application of virtual reality to deal with physical and emotional pain. 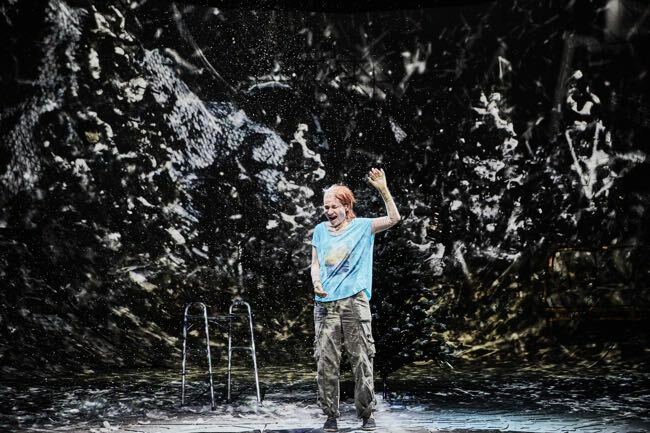 The U.S. playwright’s approach is to first show us a young female soldier named Jess who has just returned from combat in Afghanistan with fearsome wounds as she dons a virtual reality headset and then she turns the backdrop of the stage into what the ex-soldier sees. The production design is vital to the success of the play and between them designer Es Devlin, video designer Luke Halls and lighting designer Oliver Fenwick largely pull it off. Kate Fleetwood (above and below with Ralf Little), her face a hideous mask of damage done by explosives, does well to convey the young woman’s torment with neck rigid and arms and legs stiff. Ferrentino gives her some tough-minded dialogue as she adjusts to life back in Florida. The setting is the part of the state known as the Space Coast near Cape Canaveral where NASA’s Space Shuttle is making its last return trip. Unemployment is rife as the programme is shut down and the Florida heat remains relentless. Jess chafes under the cheerful attentions of her sister Kacie (Olivia Darnley) and the impositions of her ne’er-do-well fiance Kelvin (Kris Marshall). She also feigns indifference to Stevie (Ralf Little), the boyfriend she abandoned for a second tour in harm’s way. In a fast-paced single act over 95 minutes, under the smart direction of Indhu Rubasingham, the play draws sardonic humour from the way Jess uses sarcasm to deflect her anguish and in the awkward response to her wounds by the two men and the way Kacie tries to ignore them. All four give sprightly performances. Perhaps due to the brevity, the play does not touch on what the U.S. military was doing in Afghanistan nor on what virtual reality might do for Jess’s mother, seen briefly, who is stricken with Alzheimer’s. Designer Devlin works with artists such as Beyoncé and Adele and she designed the closing ceremony of the London Olympics and opening ceremony of the Rio de Janeiro event. Her work on “Ugly Lies the Bone” is impressive with a half-bowl effect in which the sloping walls shift from a 3D impression of the dull suburbs to which Jess has returned and the snowy paradise where virtual reality takes her. The National Theatre offers a free immersive installation in which to experience VR in the Lyttelton Lounge after playgoers watch the play. Venue: National Theatre, Lyttelton Stage; runs to June 6; Cast: Kate Fleetwood, Olivia Darnley, Ralf Little, Kris Marshall, Buffy Davis; Playwright: Lindsey Ferrentino; Director: Indhu Rubasingham; Designer: Es Devlin; Video Designer: Luke Halls; Costumes: Johanna Coe; Lighting: Oliver Fenwick; Music and Sound: Ben and Max Ringham. Supported by Travelex with many tickets priced at £15 for every performance. This entry was posted in Reviews, Theatre and tagged 'Ugly Lies the Bone', Es Devlin, Indhu Rubasingham, Kate Fleetwood, Kris Marshall, Lindsey Ferrentino, National Theatre, Olivia Darnley, Ralf Little. Bookmark the permalink.